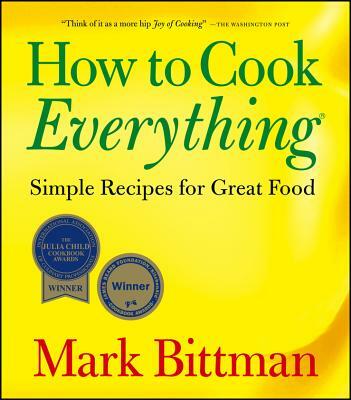 "In his introduction to How to Cook Everything, Mark Bittman says, 'Anyone can cook, and most everyone should.' Now, hopefully everyone will -- this work is a rare achievement. Mark is in that pantheon of a few gifted cook/writers who make very, very good food simple and accessible. I read his recipes and my mouth waters. I read his directions and head for the kitchen. Bravo, Mark, for taking us away from take-out and back to the fun of food." -- Lynne Rossetto Kasper, host of the international public radio show "The Splendid Table with Lynne Rossetto Kasper"
"Mark Bittman is the best home cook I know, and How to Cook Everything is the best basic cookbook I've seen." "Useful to the novice cook or the professional chef, How to Cook Everything is a tour de force cookbook by Mark Bittman. Mark lends his considerable knowledge and clear, concise writing style to explanations of techniques and quick, classic recipes. This is a complete, reliable cookbook." "Sometimes all the things that a particular person does best come together in a burst of synergy, and the result is truly marvelous. This book is just such an instance. Mark Bittman is not only the best home cook we know, he is also a born teacher, a gifted writer, and a canny kitchen tactician who combines great taste with eminent practicality. Put it all together and you have How to Cook Everything, a cookbook that will inspire American home cooks not only today but for years to come."